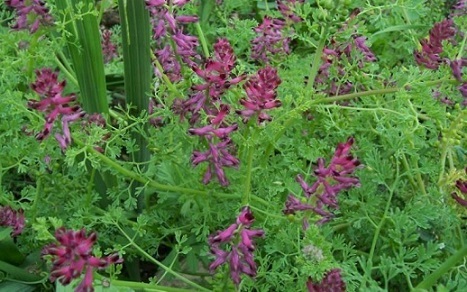 Fumaria officinalis (common fumitory, drug fumitory or earth smoke) is a herbaceous annual flowering plant in the poppy family Papaveraceae It is the most common species of the genus Fumaria in Western and Central Europe. It is an herbaceous annual plant, which grows weakly erect and scrambling, with stalks about 10 to 50 cm long. Its pink 7 to 9 mm flowers appear from April to October in the northern hemisphere. They are two lipped and spurred, with sepals running a quarter the length of the petals. Details : The fruit is an achene. It contains alkaloids, potassium salts, and tannins. It is also a major source of fumaric acid . It was traditionally thought to be good for the eyes, and to remove skin blemishes. In modern times herbalists use it to treat skin diseases, and conjunctivitis; as well as to cleanse the kidneys. However, Howard (1987) warns that fumitory is poisonous and should only be used "under the direction of a medical herbalist."